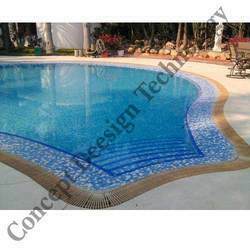 Providing you the best range of Swimming Pool Construction such as Swimming Pool, Outdoor Swimming Pools, Small Swimming Pools and Swimming Pool In Hexogen with effective & timely delivery. This subterranean leisure area is part of a new prestige development in the heart of chelsea. The 8x3 metre pool and 2.5x2 metre spa provide a unique design feature on the lowest level to accommodate the discerning metropolitan lifestyle. To enhance the sense of swimming and relaxing in a secret underground cave, a dark palate of natural stone effect finishes has been used throughout the space. A subtly concealed perimeter LED lighting system help to create the illusion of natural light filtering down from above. This subterranean leisure area is part of a new prestige development in the heart of chelsea. 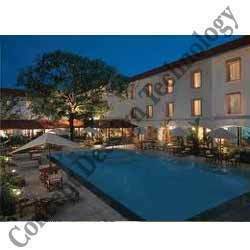 The 8x3 meter pool and 2.5x2 meter spa provide a unique design feature on the lowest level to accommodate the discerning metropolitan lifestyle. To enhance the sense of swimming and relaxing in a secret underground cave, a dark palate of natural stone effect finishes has been used through out the space. A subtly concealed perimeter LED lighting system help to create the illusion of natural light filtering down from above. This tired and damaged outdoor pool underwent an amazing transformation along with the landscaping at this beautiful property in the wimbledon area. The brief was to create the look and feel of a natural pool in a woodland and this was achieved by keeping the trees around the pool and choosing shades of cream and sand for the glass mosaic interior finishes resulting in the pool water appearing a clear, light green colour similar to that of a pond. The sawn york stone paving and sandstone coping stones add to the earthy theme and the splendid surrounding flower beds complete the tranquil scene perfectly. 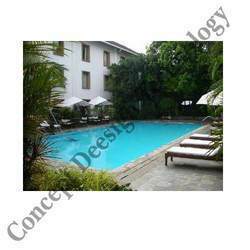 We also made the old fashioned deep pool shallower for younger children. This fresh, neat looking pool measuring 18 x 4.5 meters, is a great example of our client taking advantage of the vast space available to build as large a pool as possible accommodating both children's parties and lap swimming. The sun shining on the royal blue glass mosaic interior finishes creates wonderful visual effects and LED underwater lights and high grade stainless steel fittings complete the high end outdoor pool design. 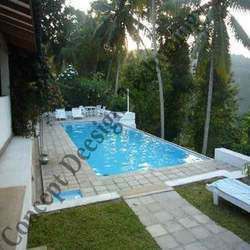 Looking for Swimming Pool Construction ?